The right-swipe gesture must be initiated from the outside edge of the screen, or almost perfectly horizontal, to trigger the back movement, otherwise you’ll likely scroll slightly down or up instead. Either of those tricks works, but the outside edge method may be easiest for most users. It does take a bit of practice, but usually after a few tries you’ll perfect it rather quickly, even if it’s not nearly as forgiving as some of the other iOS gestures, like the one to quit an app. It’s likely more strict to avoid accidentally triggering, but it does give it a slight learning curve to master. 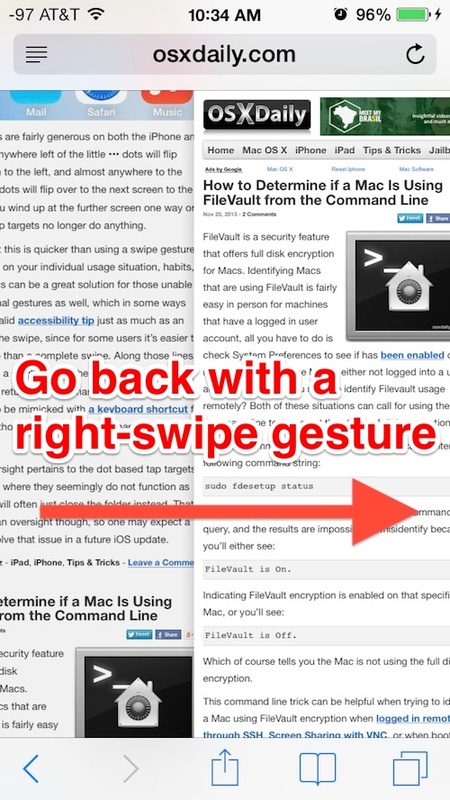 Once you get the hang of it, you’ll find the back-swipe gesture can make it easier to go back a page/panel when using a smaller screened device with a single hand, like an iPhone or iPod touch, since it can be activated with just a move of the thumb. It’s still handy on the iPad too, but be sure to use a single finger or touch point, otherwise you may wind up unintentionally triggering the app switcher or one of the other iPad specific gestures instead. Swipe navigation and touch based gestures aren’t particularly new, they’ve been on the iPad for a while, and for Mac users with trackpads or a Magic Mouse, within OS X too for navigating within Safari, Chrome, Firefox, Mission Control, skipping between Spaces, moving about the Finder, and, pretty much identical to this trick for iOS yet for OS X, go back within a lot of Mac apps too. 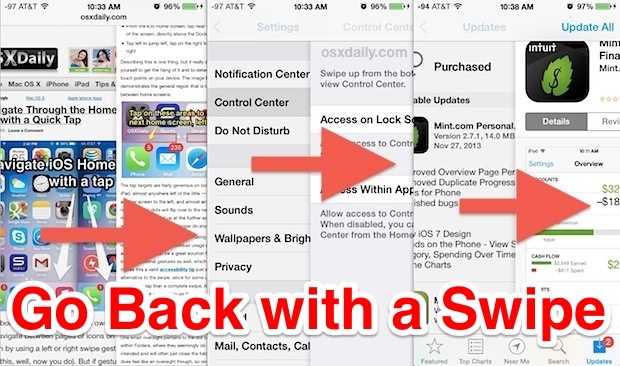 The swipe is not strict – you just have to swipe from the edge of the phone – it always works for me. Ooooh ! Swype right to go back. What a strange idea. Exactly the opposite of the natural way of working ! I’m afraid I will never be able to use this gesture.